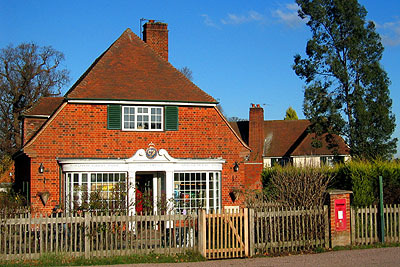 The Village was built in the centre of the Great Park in the 1930s, as homes for those who work on the Royal estate. South of the Village, Virginia Water forms the southern boundary of Old Windsor parish. The watercourse was originally called The Windles and then the Virginia River. The Duke of Cumberland had the Lake created in 1750 and it was greatly enlarged later in the same century. Within the angle of its two main arms sits part of the moat of Old Windsor Manor. The house has long gone. It had been built by Henry III in about 1245. The Great Park was created for Henry I to hunt in, probably around 1110. It was split into four walks, each with their own lodge. Windsor Forest, of which the Great Park is thus the largest modern remnant, was the scene of Robin Hood-like activity in the early 13th century. It was to here that the outlaw, Fulk FitzWarin captured King John in order to force him to reinstate his sequestered lands (including Wantage). FitzWarin had been a rival of the King’s since childhood when John had been remonstrated by his father for starting a fight over a game of chess that Fulk had won. Fulk was thus banished, the minute that John took up the throne. Fulk FitzWarin travelled the World and took part in many heroic adventures but eventually he wished to return home. Making his way to Windsor Forest, he dressed himself as a charcoal burner and fooled the King and his hunting party into following him into an awaiting ambush. His life thus threatened, John agreed to all Fulk’s demands. However, once back in the safety of his castle, he at once reneged. Fulk fled overseas once more but later returned to force the King once more to capitulate. This time King John gave in, and FitzWarin was returned to favour. Windsor Castle being a rather uncomfortable military fortress, King John's grandson, King Edward I, made the manor house of Old Windsor into a luxurious home for his family from which he could easily go out hunting in the forest and the park. As mentioned, the remains of its moat can still be seen incorporated into the northern edge of Virginia Water, but there is nothing to tell of the once great splendour within. A great hall, chapel, private apartments and kitchen were present twice over for both King and Queen. The King did not get on too well with his son, the future Edward II, since the latter was quite open about his homosexual appetite. The prince spent much time banished to the manor in the park but, despite the reasons for his exclusion from Court, this did not stop him trying to persuade his mother to intercede on his behalf and have his father send his boyfriend, Piers Gaveston, to join him! In later years, the house remained one of Edward II's favourite retreats and he transformed one of the chapels there into a Collegiate Church, complete with Dean and chaplains. However, they were never paid and Edward III eventually sent them to join the canons at St. George's Chapel in the castle. King Richard II also loved the place and made many additions and alterations, including having the chapel painted all over with his personal symbol, a rich-hart with golden antlers. As 'Manor Lodge,' the house became home of the Keepers of the Manor Walk in the 17th century. Much altered over the centuries and rebuilt around 1710, it was only finally demolished in 1792, when George IV replaced it with his extraordinary Chinese-style 'Fishing Temple'.